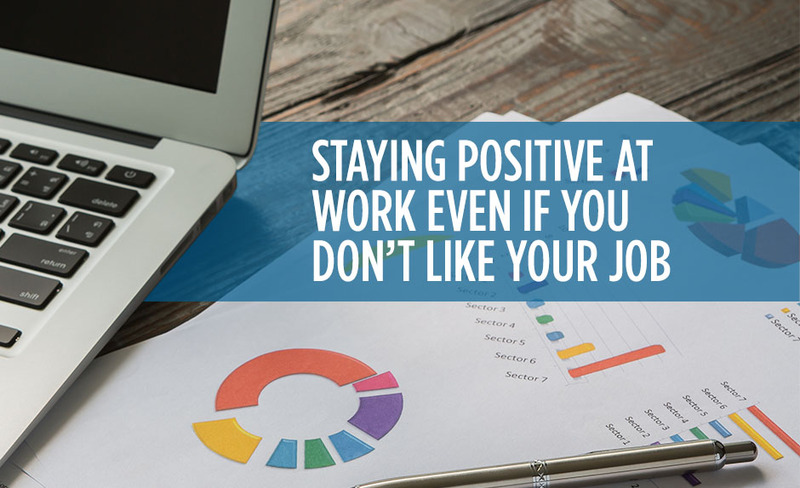 If you have found yourself in a job you don't enjoy, it can be hard to stay positive when you go to work every day. It's important you not get discouraged or give up hope your bad job will one day give way to a dream career. Remaining positive can keep you motivated to perform well and make the types of career choices that can help your career advance. Staying positive ensures your employer isn't unhappy with you, as you don't want to burn a bridge. Finding ways to make your job exciting again. If you've grown bored because the work is always the same and you're dealing with the same issues day in and day out, look for ways to make yourself excited about your job again. Talk with co-workers about their work tasks to see if you can branch out into taking on new responsibilities and take part in trainings your company organizes so you can be reminded of what you're working for. Asking your boss if you can add to the company culture. Your boss may be willing to allow you to create or join a committee so you can make positive changes – especially if there are high turnover rates. You can also make suggestions to your boss that could make the workplace vibe more positive. While there is a risk to giving feedback that could come across as negative, carefully worded suggestions will often be well received and – if implemented – could forever change the way you feel about your job. Avoiding instigating problems with co-workers. If you find yourself feeling angered or frustrated by a co-worker, remember you cannot control their behavior; you can only control your reaction to it. Look for the good in everyone when you go to work each day so you change your mindset and view the difficult worker not as an annoyance, but as an opportunity for you to grow personally by working with someone who is different than you. While maintaining a positive attitude even in the face of job adversity is important, you don't want to stick it out at a bad job forever. Eastridge Workforce Solutions can help you find new opportunities where you can thrive professionally so you can say goodbye to your bad job forever. To find out more about how we can help you to find a new position where you'll be a good fit, give our staffing service a call today.